The Genting Casino Coventry Blaze ended their Challenge Cup campaign with a 0-4 defeat to the Cardiff Devils at the Skydome Arena. With the Devils already safely through to the quarter-finals and Blaze’s participation in the competition ended by Milton Keynes last week, both teams took the opportunity to give their back-up goalies a start. Jordan Hedley was the first to be beaten in the Coventry net on 6.58. Tom Rutkis, also enjoying additional ice time, scoring for the Devils in-close. British forward Sam Duggan, making his Cardiff debut after junior time in Sweden hit a post on the breakaway, before Kevin Morris had the same opportunity to beat Tom Murdy in the Devils goal, the Blaze Captain though shooting over. It took until 40.58 for a second goal to come in the game and it was the away side who doubled their advantage through Mike Hedden. 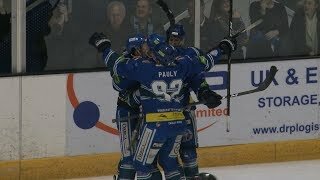 After Gleason Fournier hit Hedley’s goal pipes for a second time, a third strike came for Cardiff with Layne Ulmer tipping home a high Bryce Reddick shot on 46.58. Ulmer was on the scoresheet again at 52.30, the puck falling kindly for the Canadian in a mass scramble to round out the scoring 0-4. Head Coach Danny Stewart said, "Tonight was frustrating and it sums up our Challenge Cup campaign. Our inability to put the puck in the net in those games. 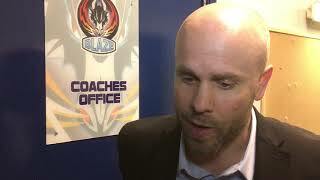 As an organisation, we take pride in the competition and it's a couple of years on the bounce now where we have failed to progress and it's unfortuante but it's behind us now and we have to look ahead to Wednesday (away vs. Sheffield Steelers)."